When I was a little, I had the good fortune to have my mother’s office located near one of Singapore’s famous hawker centres on Amoy St. She and I would walk, hand in hand, to get breakfast before she dropped me off to childcare/Kinder, and I would invariably want to get Chee Cheong Fun – rolled steamed rice noodles smothered in a thick sweet hoisin-type sauce, sometimes with a bit of chilli on the side. The portly man who owned the stall wore a white wife-beater, and stood, tall and wide amongst the steamers, taking orders and serving up dishes with lightning speed and a seemingly perfect memory. That stall has long since disappeared from the horizon of fluorescent-lit food stalls, but the memory remains. A simple plate of Chee Cheong Fun still triggers those childhood memories with my mother, and the simpler times when my day started with these comforting noodles and ended with an egg braised in duck masterstock. At Sedap – which translates to “delicious”. Setting the bar a little high are we? 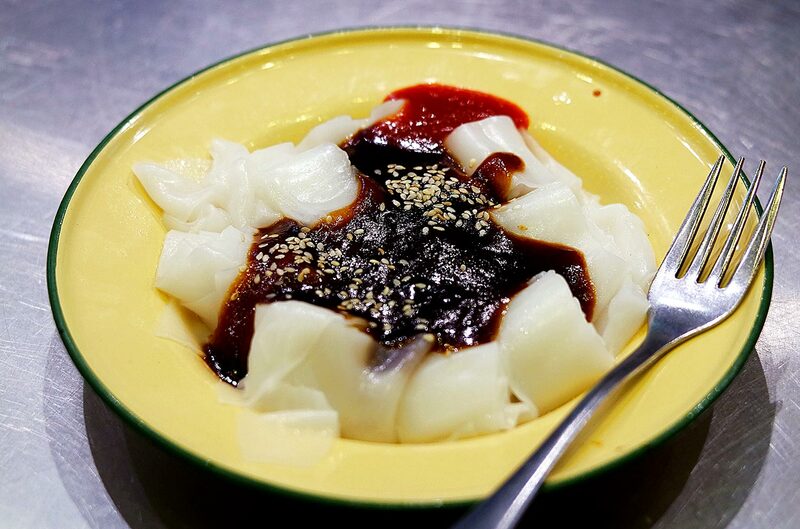 – Chee Cheong Fun is served on an enamel coated tin plate, with the typical sweet sauce and chilli from my childhood. The first bite into the silky noodles brought back all sorts of memories, and really hit home for me. It was a touch on the pricey side considering the raw materials, but it is the city after all, and the friendly staff made up for it. I haven’t heard too much about the rest of the menu though, but it does seem interesting enough for me to make a return trip to try it out. And if nothing else, there’s always Chee Cheong Fun. yum! they have this at yum cha too but served with both hoisin sauce and peanut butter 🙂 i think you’d like that!